I love cheese. I love aged, fresh, fragrant, stinky, hard, soft; you name it I love it. So it should come as no surprise that I love risotto. I love the creamy and soft texture, and the rich taste. But unfortunately, I am terribly lactose intolerant. Luckily, I was able to find an acceptable – well more than acceptable, quite delicious – substitute for risotto. I call it my “faux risotto.” I don’t use arborio rice. I use what I have on hand, usually cooked short-grain brown rice. And I often have baked chicken in the fridge. So I just chop it up and throw it in the pan. As you can see, this recipe is not as laborious as a traditional risotto recipe. It’s actually quite easy. It takes me about 15 minutes to put together. I add a little bit of butter to the dish at the end of the cooking process. For some reason I can tolerate little bits of butter. As you might have guessed, I take advantage of this anomaly as often as I can. 🙂 That little bit of butter really enhances the flavor. But if you want this dish to be completely dairy-free, omit the butter and use toasted sesame oil instead. Either way, the dish is absolutely delectable , not to mention gluten-free and optionally dairy-free. Heat a pan on moderately high heat. Add enough oil to coat the bottom of the pan. Add the onions and mushrooms to the pan. Sauté until the onions are translucent and the mushrooms are golden brown. Add a pinch of salt and stir. Add the rice to the pan and mix well. Add 1/2 cup of broth, pinch of salt, and chicken (if using). Stir until the entire mixture is heated through. Add more broth if necessary (also depending on the preferred consistency). * When the mixture is heated through, add the tamari and butter/sesame oil. Turn off heat immediately and mix. Taste for seasoning. If necessary, add salt to taste. Mix. Add a generous amount of fresh ground black pepper. Garnish with chopped onions. I end up using about 3/4 cup of broth. Don’t be afraid to add more broth, if the consistency gets too dry or sticky. For a dairy-free option, use toasted sesame oil instead of butter. Just add a drizzle at the end as a finishing oil. Be sure to turn off the heat immediately after adding the tamari (gluten-free soy sauce). You don’t want the tamari to cook. It really makes a difference in taste. You can also add some frozen peas or a big handful of spinach/baby kale. Add them to the pan when you add the broth. That sounds about right for dinner. nah I wouldn’t have believed you if you said you stopped eating cheese completely. Hey Helene, welcome! I don’t think I have the willpower to cut it off completely. 🙂 I admire anyone who can. Love the recipe! Have you tried eating hard or aged cheeses? I have the same problem, but can tolerate hard cheeses like Parmesan. The process of fermentation and higher fat content contribute to less lactose. And the aged (over two years) cheeses have practically no lactose. Hey, this looks so yummy! 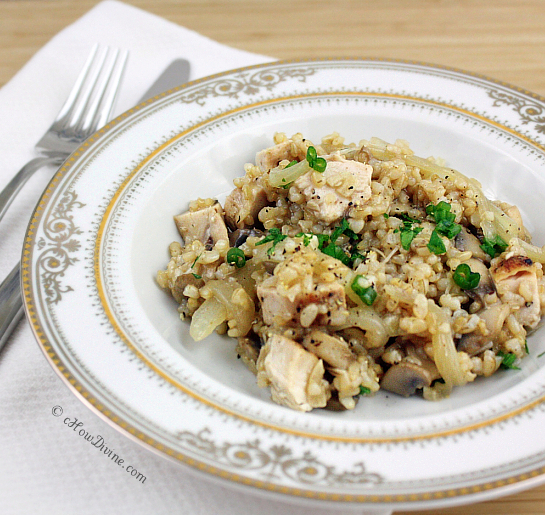 My favorite rice and mushroom dish makes me hungry. I don’t know if I could give up cheese either….nothing can replace real thing! And I love, love creamy risotto especially with mushrooms….like you said I make it with whatever I have on the hand…even with barley pearls which my family loves–but you can’t eat barley, right because of the gluten? 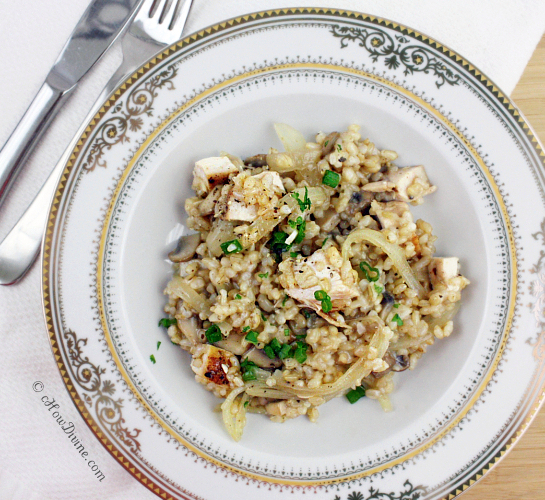 Got to make your recipe soon…because I never added tamari before in risotto and sounds tempting! Hi Sandra! I eat barley once in a while. I’m pretty bad at cutting things out completely. I would rather pay the price after. 🙂 I add the tamari, because it has a pungency that’s reminiscent of aged cheese (to me anyway), especially when it combines with butter. Tamari is aged also; so it makes sense I suppose. Give it a try. I hope you like it! I’m so excited that I can make “risotto” with brown rice now. I will definitely be adding a little butter at the end of the cooking. Thanks! I absolutely love this as a quick option to such a flavourful favourite! Thanks for sharing such a tasty, simple recipe! I’m really excited to see this risotto. 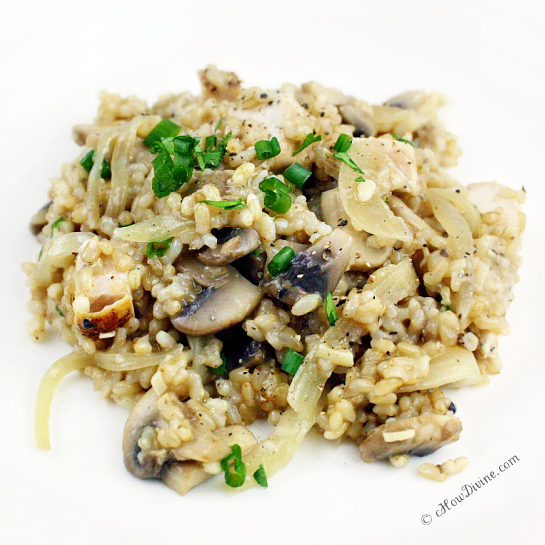 I love mushrooms too, but risotto is my favorite! And you used tamari and sesame oil? I MUST try this recipe. Thinking of sesame oil, my stomach is reacting to my thoughts…. 🙂 I love love love your photography too. I am extra hungry now. We don’t eat brown rice, but will try with regular rice! I never liked mushrooms as a child, but I LOVE them now – especially with onions. I eat them all the time. Good thing they’re healthy. 🙂 Thank you for your kind words Nami! I hope you are having a great week!! !